This sterling silver guardian angel heart pendant is double sided with a guardian angel on one side and an inscription of 'Guardian Angel Protect Me...' on the other. This unique pendant would make a great gift. Available with an 18" pendant chain and comes in a jewellery presentation box. Size 15mm. Sterling Silver Guardian Angel Heart Pendant is published by L J Designs and is our 30513th best seller. The ISBN for Sterling Silver Guardian Angel Heart Pendant is CMER7400. Be the first to review Sterling Silver Guardian Angel Heart Pendant! Got a question? No problem! 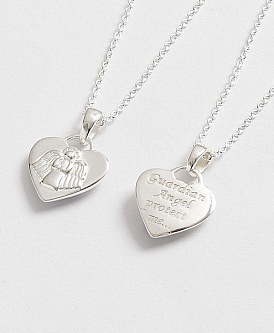 Just click here to ask us about Sterling Silver Guardian Angel Heart Pendant.